Karnataka has some of the most beautiful waterfalls in the southern part of India. Among the list, Kadambi Falls also holds a special position. 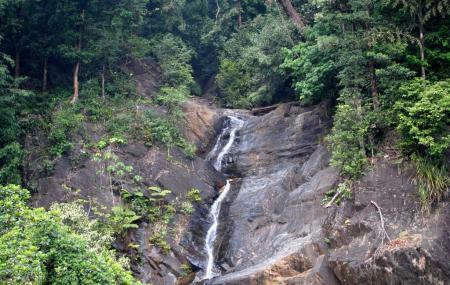 As you approach Kudremukh National Park from the main road lying between Sringeri and Kudremukh, you can locate this 30 feet long waterfall from its stunning sight. The roaring sound of the water and its milky white color is surely going to put you in awe of its majestic beauty. Though you need to face few hurdles, make sure you take a closer look at the waterfall. If you are not scared of climbing small rocks then try to get into the pond that is naturally created at the bottom of the waterfalls. Soak your feet and feel the freshness of nature which is somewhat absent in the developed metropolitan cities. Wear proper shoes to get down into the waterfall. You can visit the waterfall any time of the day. How popular is Kadambi Falls? People normally club together Sringeri Sharada Peetham and Hanuman Gundi Falls while planning their visit to Kadambi Falls.